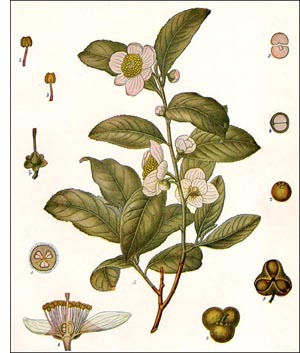 The highly esteemed drink, Tea, is made from the leaves and very young terminal branches of a shrub known as Camellia Thea. The shrub is spreading, usually two or three meters high, though it may attain a height of nine or ten meters. It has smooth, dark green, alternate, irregularly serrate-dentate, lanceolate to obovate, blunt-pointed, simple leaves. The young leaves and branches are woolly, owing to the presence of numerous hair-cells. The flowers are perfect, solitary or in twos and threes in the axils of the leaves. They are white and rather showy. Some authors state that they are fragrant, while others state that they are practically odorless. Stamens are numerous. The ovary is three-celled, with one seed in each cell, which is about the size of a cherry seed. The tea-plant is no doubt a native of India, upper-Assam, from whence it was early introduced into China, where it is now cultivated on an immense scale. It is, however, also extensively cultivated in various parts of India, in Japan, Java, Australia, Sicily, Corea, and other tropical and subtropical countries and islands. It is also cultivated to some extent in the southern United States, as in Carolina, Georgia, Mississippi, and California, but apparently without any great success. 1. GREEN TEA. -After collecting the leaves are allowed to lie for about two hours in warmed pans and stirred and then rolled upon small bamboo tables, whereupon they are further dried upon hurdles and again in heated pans for about one hour, accompanied by stirring. The leaves now assume a bluish-green color, which is frequently enhanced by adding Prussian blue or indigo. Of these green teas, the most important are Gunpowder, Twankay, Hyson, Young Hyson, Hyson Skin, Songla, Soulang, and Imperial. 2. BLACK TEA. -The leaves are allowed to lie in heaps for a day, when they are thoroughly shaken and mixed. After another period of rest, two or three days, they are dried and rolled much as green tea. In the storing process the leaves undergo a fermentation which develops the aroma and the dark color. The following are the principal varieties; Campoe, Congou, Linki-sam, Padre Souchon (caravan tea), Pecoe, Souchong, and Bohe.